The area of Treasure Beach, St. Elizabeth has been earmarked as a pilot project in the drive to further develop community tourism across the island. In support of this programme, the community has received an injection of $48 million from the Tourism Enhancement Fund (TEF) to help fund its development projects. Stakeholders in Treasure Beach recently welcomed the announcement by Tourism and Entertainment Minister, Hon. Dr. Wykeham McNeill that the area which is renowned for community tourism would be the first to benefit under a new initiative to assist community tourism enterprises. The programme forms part of efforts to implement the Community Tourism Policy recently tabled in Parliament. The Minister stated that a total of $20 million of the total allocated is to be used as a revolving loan fund to assist smaller properties that are facing challenges to equip themselves in order to acquire operating licenses from the Jamaica Tourist Board which has specific standards for approved tourism entities. Minister McNeill informed the Treasure Beach stakeholders that they would become eligible for various benefits as long as they were undertaking steps to become compliant with the revised Tourist Board Act. To get this going, attention is being given to formulating a Development Order to ensure that the character of the South Coast is protected. To this end, community tourism is seen as one of the avenues to making the industry more inclusive. Since last year the Tourism Product Development Company (TPDCo) has been working with the Policy Division of the ministry to address the issues that arise. These include marketing and compliance with licensing regulations. While recognizing the need to protect the industry, Dr. McNeill said there had to be realistic standards for small and large properties as “some of the things that are in place for large properties are not practical for smaller properties and we want to ensure that the smaller properties are able to benefit from tourism.” Attention is also being given to attractions. The community tourism plans outlined for Treasure Beach were endorsed by a wide cross section of stakeholders, including Mayor of Black River, Councillor, Everton Fisher; Chairman of the South Coast Resort Board, Anthony Freckleton; founding chairman of BREDS Foundation and pioneer Treasure Beach hotelier, Jason Henzell. 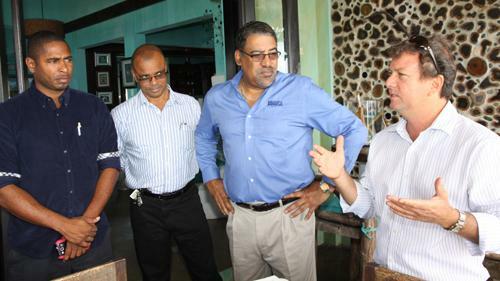 Prior to the stakeholders meeting Dr. McNeill and senior executives who head key departments in the tourism ministry and its agencies were taken on a tour to sample what Treasure Beach has to offer and hear first hand from stakeholders. They were accompanied by tourism partners from the area including Mr. Henzell and Rebecca Miersma. The tour included visits to Ital Rest which is run by six Rastafarian brothers and their families, Seaweed Villa and the Treasure Beach Women’s Group Craft Shop, which provides a livelihood for some 80 craft traders.